I am a Research Assistant/Technician at the Castellarin Lab. I received my Bachelor of Science in Food Nutrition and Health from the University of British Columbia in 2018. I primarily assist in the water deficit and crop load trial project that is ongoing in the lab. My contribution to the lab includes sample harvest, sample preparation, metabolite extraction, nucleic acid extraction, qRT-PCR, volatile analysis (GC-MS), method testing and validation. 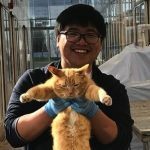 I really like plant science, genomics, analytical chemistry and cats.